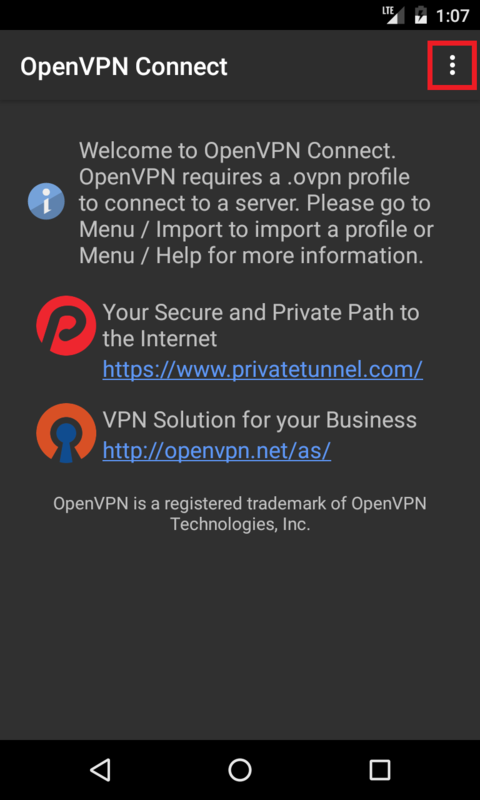 Install from Google Play Store OpenVPN Connect, the official OpenVPN client for Android developed by OpenVPN Technologies, Inc. NOTE: don't use the default Android browser because it has an unresolved bug. Chrome and Opera have been tested by us and work. Log in the AirVPN website and create the configuration files from our Config Generator. Choose Linux as platform (only direct TCP and UDP connections are supported) and finally click then "Generate" button to download it. Downloaded .ovpn files may be imported directly into the application but the behavior depends on many factors (employed browser, files manager, Android version, etc). 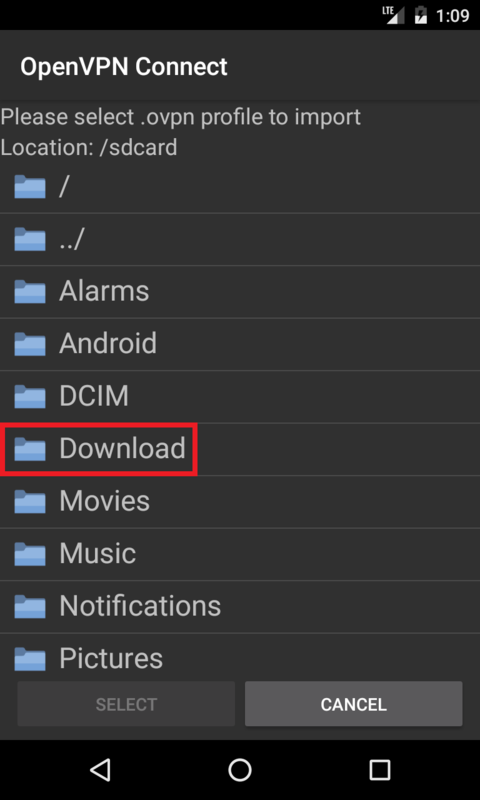 For simplicity's sake, we assume in this guide that you saved .ovpn generated files under the Download's directory in the Android filesystem. 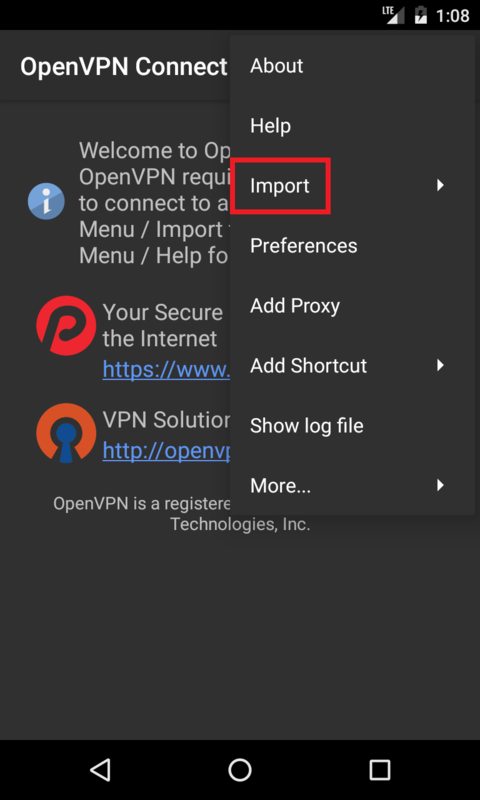 Just to confirm, the only reason you are recommending the openvpn for android over this package is because this one is not fully open soruce, correct? according to the directions, it seems simpler to use this here. I tested it myself and OpenVPN for Android is more comprehensive than this. You can do more things with it. They don't only recommend it because of it's open source status (although they write it).. AirVPN is trying to deliver a great service and their recommendations support this aim. sir why i cant connect ? ! there are a TSL - error ?please reply godbless ! @ i want to test this airvpn ! !im using a android phone! How can I set up the vpn in my settings instead of using an app? I want to use p2p app on android device, but don't know much about port forwarding and this is my first time using a vpn. Android does not include integrated support for OpenVPN servers. That's why you need an app which uses the VpnService API introduced in Android 4.0. Regarding port forwarding: Go to Client Area > Forwarded Ports and simply click on the +Add button. It will forward a random port for you, let's say, it's 9000. Then configure your P2P client to use the port it forwarded for you, in this case 9000. I want to generate configuration for my UDP port 9201 . But here is no option for it. Please Help me. 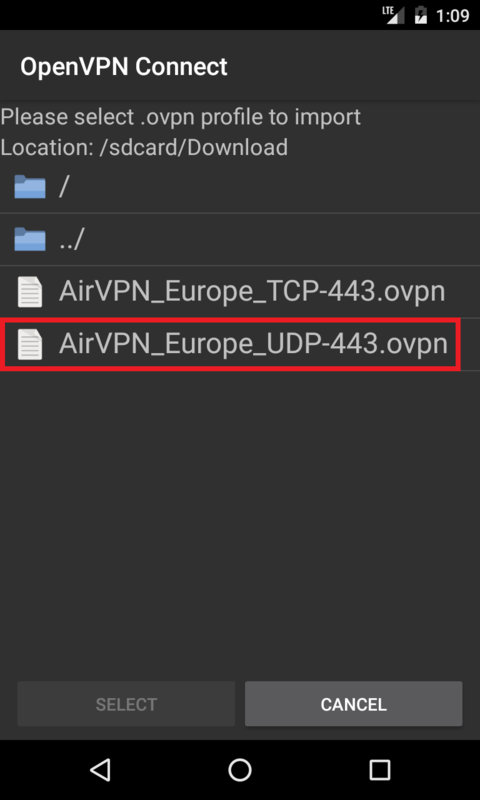 This is anecdotal, but I can tell you that I spent a long time fiddling with OpenVPN Connect and never got it working with AirVPN on my Android device. When I found OpenVPN for Android it worked immediately - very easy to set up. I would also like to add that OpenVPN Connect doesn't appear to be compatible with a very useful Xposed Module called "Auto VPN Dialog Confirm". 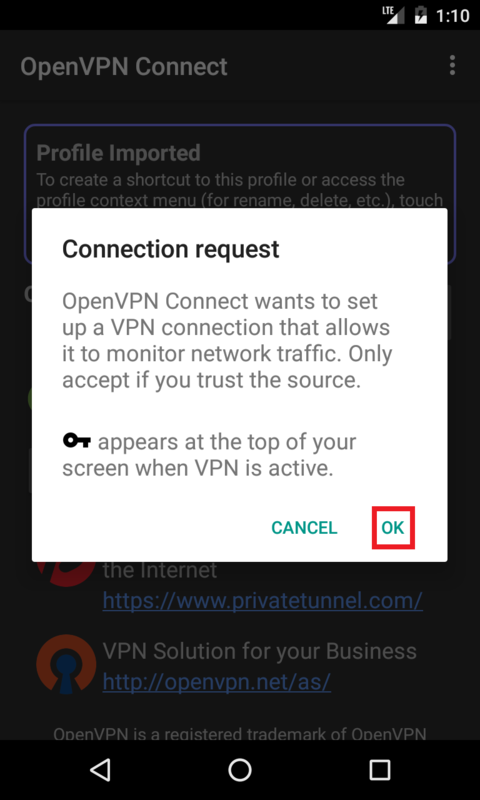 Without this module, every time you try to connect to a VPN, Android makes you confirm that you trust the VPN connection, even if you check "don't ask me again". I have this module installed with OpenVPN for Android so every time the device starts up it automatically reconnects to the VPN without any user input. Note: your device has to be rooted to use the Xposed Framework. I just got a Blackberry Passport and wanted to set up the VPN profile. Is there a quick link for the following? Gateway Type - Generic IKEv2 VPN Server? Authentication Type - PKI ? 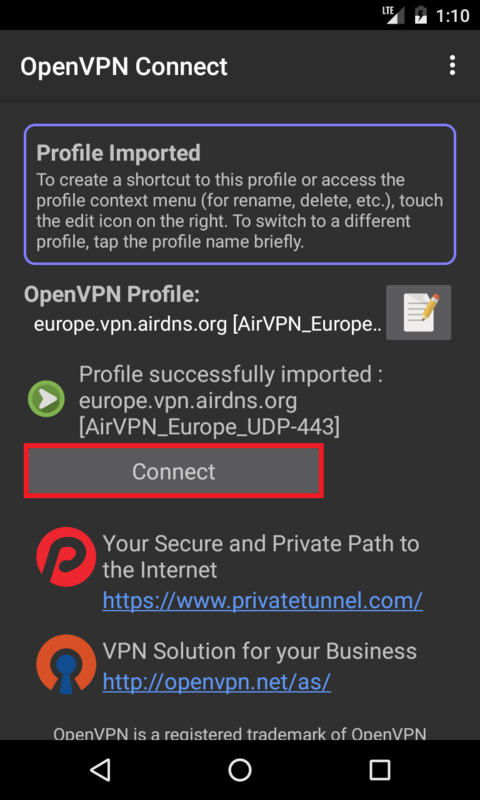 I managed to get connected to AirVPN on Android using OpenVPN and TLS/SSL Tunnel. It took a few attempts, and I had to convert the crt file to a der file. Once it was converted, I saved it to my dropbox file and then downloaded it into Tunnel's Certificates Database. After that, I manually added the tunnel parameters into the app, setting the root certificate is set to custom cert store, and then ran the tunnel. After that, I started up OpenVPN and connected using config that connects to the tunnel. Sadly, it wasn't working with this closed source program, but it worked with OpenVPN for Android and even the Root-required version of OpenVPN. It's strange, but regardless at least now I'm able to connect to here with SSL. Not sure where this should be, but it's the best open thread I could find, and it applied to Android. These settings refer to a VPN setup with IPsec protocol. IPsec is not supported by AirVPN's servers. You need an OpenVPN client. Anyway, why are you posting it here? 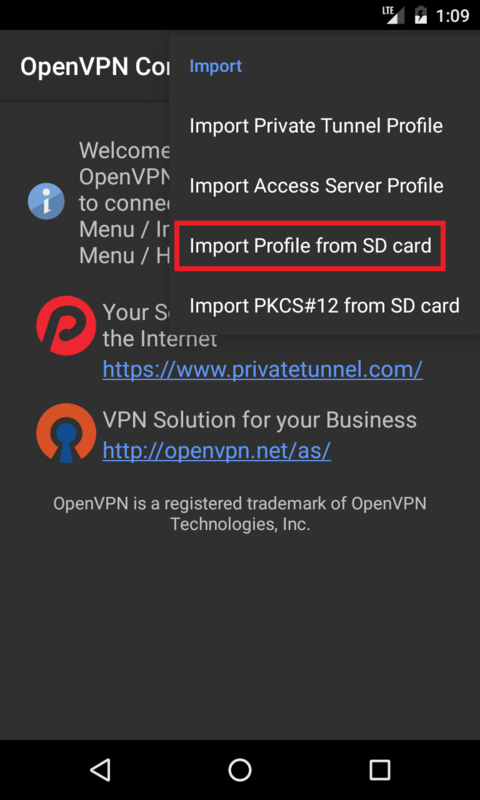 This thread is dedicated to OpenVPN Connect for Android OS.